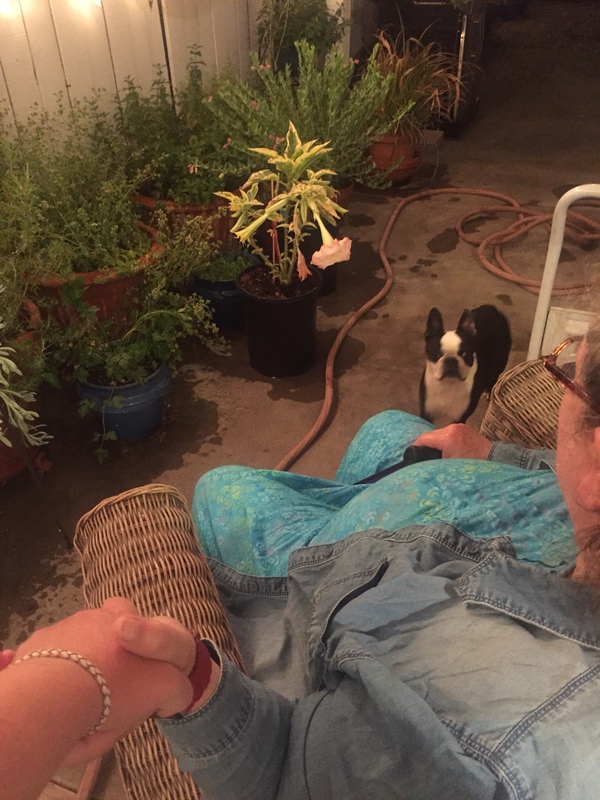 After a hot day in Santa Rosa, Mama and I decided to cool down in our garden this evening. 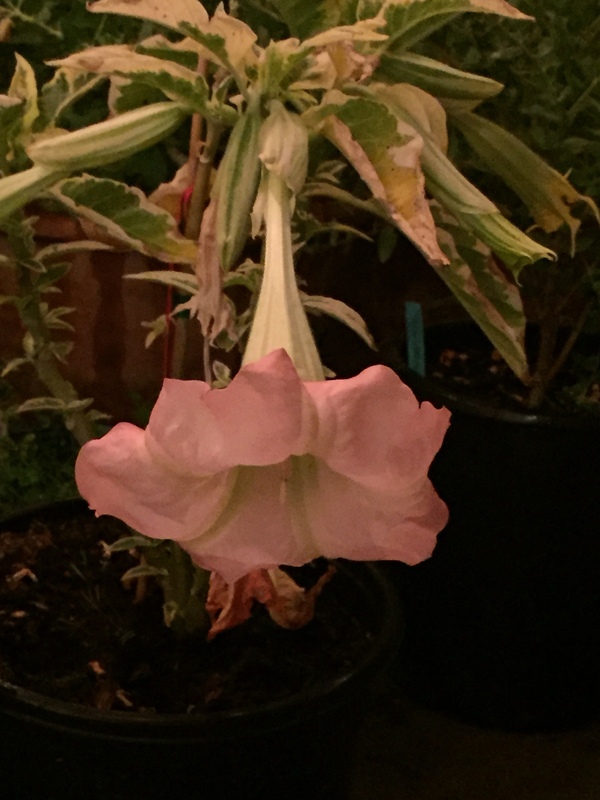 As I began our nighttime watering, I noticed our first blossom had appeared on our Angel’s Trumpet tree. I waited for Mama to notice, camera poised, and I wasn’t disappointed. She was so overcome with joy to see this bloom in our own backyard that she began to cry happy tears and sat down in her rocker for a closer look. Mama has loved these pendulous flowers for many years. After much persistence, we recently tracked one down for our own garden (though I haven’t had a chance to plant it yet). These bell-like flowers, also called Brugmansia, come in many different colors and can be a shrub or a tree. Today’s #OneGoodThing was Mama’s beautiful reaction to our first Angel’s Trumpet flower. Day 180 of 365. And Day 911 in a row (here’s the first 366 & the following 365)! 1 year ago today: Plums galore and zucchini every day! How wonderful! I can SO RELATE! Decades ago, my now-ex tore out an Angel’s trumpet shrub in our back patio and covered the little plot of earth with concrete (this while I was on a trip to Bulgaria). For years, I have tried to start cuttings from local Angel Trumpet trees. No luck! Until last fall. My cuttings are now planted in our front yard and are growing beautifully! I will probably shed a tear or two when the first blossom appears. Hugs to Mama!